We are presenting a work entitled 'Thirteen Points, Expanded' at &Model gallery in Leeds as part of the Wayfaring exhibition curated by the artist Laura White. Focusing on the ‘Interface Areas’ that separate Nationalist and Unionist communities in Belfast, 'Thirteen Points, Expanded' reflects on the specific spatial and psychological conditions that contour the parts of the city that have been segregated as a result of the political conflict in Northern Ireland. The work is in three parts, subtitled Plan, Section & Elevation: The ‘Plan’ is an architectural part of the work; the ‘Section’ is a HD video work; the ‘Elevation’ is a collection of thirteen prints on aluminium panel. Wayfaring, curated by Laura White in collaboration with &Model Leeds, looks at the territory White shares with other artists whose work asks similar questions and who also travel across diverse disciplines, as writers, researchers, educators, makers, craftspeople, film-makers, architects or poets. In fluid movement between investigations and disciplines, processes are revealed and are always open to further possibilities. Materials drive the process as much as the artist handling them (film, video, architecture, words, leather, clay, paper, photography) and thinking through making and understanding by doing are central to how these artists work and the way the exhibition is made. Preview on Thursday 28 April 2016, 6pm-8pm, then open Wednesdays to Saturdays, 2pm to 5pm until 4 June 2016. We will be presenting and discussing our work in relation to the architectural film essay at this forthcoming event. Architecture | Essay | Film is a one-day symposium bringing together filmmakers, architects and theorists to discuss the role of the ‘essay film’ in architecture. Originally coined by the German artist and filmmaker Hans Richter, the term essay film describes an intimate, allusive and idiosyncratic genre at the margins between fiction and documentary. Although under-theorised the essay film has a long history as a ‘form that thinks and thought that forms’ according to French film essayist Jean-Luc Godard. Architecture | Essay | Film will focus on essay films that take as their subject matter architecture or the city, what we call ‘architectural essay films’. We have asked our speakers to reflect on: What are the characteristics of the architectural essay film? Do architectural essay films unlock the storytelling, political and philosophical subconscious of architecture? Can architectural essay films be seen as a design research method, bridging theory and practice, as well as filmmaking and architectural proposition? Conceived and developed by Dr Penelope Haralambidou, the symposium is organized by Anna Andersen, Dr Penelope Haralambidou and Phuong-Trâm Nguyen at The Bartlett School of Architecture, UCL. We will be reading from a selection of works including Falling (Copy Press, 2015) and the forthcoming Field Poetics (EROS Press, 2017). In addition, they will screen a selection of video work that is made in parallel to the text works. The reading/screening will be followed by a conversation between Kreider + O’Leary and writer and academic Maria Fusco. 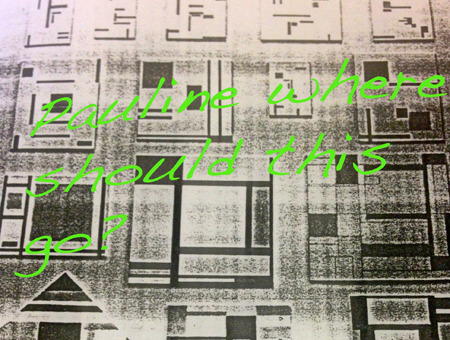 This is the second event in the Experimental Writing @ Carroll/Fletcher series. Organised by the Institute for Modern and Contemporary Culture at University of Westminster and Carroll/Fletcher, the series showcases contemporary developments in experimental writing and their relationship to the visual arts. James discusses his research into the ‘Interface Areas’ that separate Nationalist and Protestant communities in Belfast along with Dr. Mel Jordan and two other PhD students as part of the TECHNE/Royal Holloway Practice-based PhD Programme Seminar. To what extent can public sphere theory contribute to the understanding of art, its function and its publics in the practice of the Freee art collective 2004- 2012? Freee’s art practice (2004 – 2012) has been concerned with the notion of the public sphere. My research proposes that the use of public sphere theory -the philosophy of participatory and deliberative democracy in general – could aid a more complex analysis of art and it’s onlookers. Public sphere theory theorized by Williams (Williams: 1958), Habermas (Habermas:  1989), Mouffe (Mouffe: 1999), Fraser (Fraser: 1990) – suggests ways in which dialogic understanding and the resolution of differences may aid engagement by a range of publics, including those normally marginalized or excluded from the public sphere. This presentation will introduce the theory of art and the public sphere and discuss how my art practice was used as a methodology for addressing the problems outlined in the research. > Dr Melanie Jordan is an artist and academic; she works collaboratively with Dave Beech and Andy Hewiit as the Freee art collective. Jordan’s research is engaged with problematising the historical understanding of public art by utilising public sphere theory to enable a new understanding of art and its publics. Jordan is principal editor for the journal, Art and the Public Sphere. Kristen will be presenting our work on Open City at the Centre for Performance & Creative Exchange at Roehampton University. Open City (Ciudad Abierta) is a radical pedagogical experiment started in 1970 by the Argentinian poet Godofrodo Iommi and the Chilean architect Alfredo Cruz as part of the Catholic University of Chile at Valparaìso. Situated on a strip of sand dunes just off of the Pacific Ocean, Open City consists of a constellation of building works that, together, make up a recognisable – if unusual – urban system. Here one finds an agora, a chapel, a palace, a garden, a cemetery, a music room and numerous hospederías where people live and work. As per the ethos of the Open City, all building works begin with poetry and building construction is carried out in an ad-hoc, accretive manner by students and staff who live and work on site. In this manner, the foundation for architectural knowledge shifts from the realm of formal geometry and mathematics to that of poetry and the word, while production becomes inherently linked to a sense of community, occupation and social responsibility. This talk tells the story of Open City, touching on its ethos as well as its key elements and practices. In the course of this telling, details drawn from a site study undertaken by Kreider + O’Leary at Open City last year act as springboards into an exploratory discussion of Open City as an alternative – resistant – site of knowledge production. James will be launching the Peacewall Archive with an exhibition entitled ’Fragments of the Peacewall Archive’ at the the Kinesis & Stasis Conference at the Barbican Centre, London on Friday, 27 November 2015. This project is the first in a series of works entitled 'Interface Architecture'. - The Bartlett Architecture Research Fund, University College London. Kristen will act as a Plenary Speaker for Against Delivery at the Slade School of Fine Art. On 12-13 November 2015 the Slade School of Fine Art, UCL, doctoral programme will be hosting a two-day research event under the auspices of the European Artistic Research Network (EARN) and the London Arts and Humanities Partnership (LAHP) entitled Against Delivery. The event will take place at the Slade Research Centre Woburn Square in central London and is open to staff and students from UCL, LAHP and EARN. We will be presenting Falling Fugue II with writer and musician Doug Cowie for the finale of the Literary Kitchen Festival in Southeast London. A scene is set through music, image, text and, through this, the figures are falling. From zero gravity to everything flowers we hear of philosophy, laughter, architecture and war. As the event gathers momentum, a picture emerges: it looks something like today. Kreider + O’Leary have been selected by Tate Curator Marianne Mulvey and Videogud to present video work at a group show entitled “Architecture, Performance, Materials” in various public spaces throughout Sweden from September 3rd, 2015. Videogud is a collaboration between art and film units in the counties of Gävleborg, Uppsala and Dalarna in Sweden. The network aims to make current video art accessible to all,by commissioning video projects for display on its video stations, which are located at health care facilities, libraries, schools, museums and cultural centers throughout the country. For this exhibition, Kreider + O’Leary will exhibit a 9 minute video work entitled ‘LA Tapped’, recorded in Los Angeles in 2010 and edited for this exhibition in 2015. ‘LA Tapped’ is a spatial enactment of the Westin Bonaventure Hotel in downtown LA. Here Kreider + O’Leary perform the building as per philosopher Frederic Jameson’s reading of it – as a model of postmodern architecture and an allegory for the logic of late capitalism. The video documents a recurring tap dance routine, performed at various locations throughout the Bonaventure including elevators, walkways, conference spaces, service areas, shops, elevated running track and outdoor pool. The tapping sound solicits a response from the architecture, providing a nuanced reading of the materiality of the various spaces encountered. As the performance proceeds, the sound recorded in the Bonaventure is fused with sound sampled from John Pilger’s film ‘The War We Did Not See’ exposing the enmeshment of representations of our built environment with the logic of late capital, and the systematic violence that this logic upholds and reinforces. “Architecture, Performance, Materials” is curated by Marianne Mulvey - Tate Curator of Public Programmes. We have contributed a chapter to the book Drawing Ambiguity: Beside the Lines of Contemporary Art, which has just come out with I.B.Tauris. The chapter, entitled 'Particles of Moisture and other Substance Suspended in Air and Visible as Clouds: Approaching Ambiguity through Site-Related Creative Practice' outlines a history, theory and practice of site-related creative practices across poetry, art and architecture. In setting this out, we argue for the importance of ambiguity in such practices, including our own. Alongside this written component, we engage with an expanded drawing technique to delineate the specific narrative of one of our site-related projects, Video Shakkei. Drawing Ambiguity: Beside the Lines of Contemporary Art, edited by Phil Sawdon and Russ Marshell, is the third book in the innovative TRACEY series on contemporary drawing. Drawing Ambiguity builds upon its predecessors, Drawing Now: Between the Lines of Contemporary Art, 2007 and Hyperdrawing: Beyond the Lines of Contemporary Art, 2012, by proposing that a position of ambiguity, a lack of definition, is not only desirable within fine art drawing but also necessary - having the capacity to enable and sustain drawing practices. What happens if we are ambivalent to what is a drawing, or what drawing is? See our Publications page for more information. We are exhibiting work as part of I'M Ten to celebrate IMT Gallery's tenth anniversary. I’M Ten is a benefit auction and exhibition of over 150 emerging and established artists, brought together to celebrate IMT Gallery’s 10 year anniversary. All artworks will be auctioned off on Paddle8 at a starting price of £50 from the 17th of September – 2nd October 2015. I’M Ten selections were nominated by artists including: Oreet Ashery (Artist), Stuart Brisley (Artist), Mark Doyle (Independent Art Consultant), Elisabetta Fabrizi (Curator, Tyneside Cinema), Kenneth Goldsmith (Poet and Founding Editor of UbuWeb), Sean Griffiths (Architect and Founder of FAT), Kelly Large (Public Programme Curator, Zabludowicz Collection), Ana Ventura Miranda (Director, Arte Institute) and Aura Satz (Artist). Since its opening as a non-profit gallery, IMT Gallery has built a reputation for its innovative site-specific installations as well as its championing of sound art and of artists working across media. The sale of works in I’M Ten, all of which have been kindly donated by participating artists, raises funds to continue to support IMT Gallery’s ambitious public and curatorial programming, as well as towards building new resources for supporting artists. We are presenting work on Open City for the conference Production Sites at the Bartlett School of Architecture on 28029th July. PRODUCTION SITES is a conference that scrutinises new cultures of architectural knowledge by examining the sites where knowledge is produced as a discipline. Architecture has largely framed knowledge through the idea of building types, formal styles or sites for design action. Yet participatory design modes, digital technologies and event-based models present alternatives that probe the divisions between real and imaginary sites, experiential and ideatic encounters, aesthetics and technology. What are the emerging alternative sites, where knowledge is generated or from which it is also drawn? How do these relate to traditional sites and well-established typologies such as the architect’s office, the university, the museum, the exhibition, or the library? How do new scenarios present an adaption or substitution of these frameworks? What are the modes of pro¬duction that are related to these sites, and the associated tools and methods? And, apart from architects themselves, are there other producers of knowledge relevant to the architectural discipline, such as users, curators, theoreticians, activists or ‘cross-benchers’ (Markus Miessen)? Conference organisers are Sophia Psarra (s.psarra@ucl.ac.uk) and Sandra Löschke (sandra.löschke@sydney.edu.au). Lectures and presentations in architectural theory and design settings are almost always constructed through combinations of the visual and the verbal. The lecture is spoken against or around a backdrop of visual images, usually slides; the design presentation consists of verbal explanations to a set of drawings. Ensuing discussions evolve through visual and textual relations. Many practitioners from various fields use or have used ‘voiced’ forms: Luce Irigaray looks closely at the voice as a haptic presence; Laura Mulvey at the politics of the image; Jane Rendell the positioning of the author; Roland Barthes at the rhetoric of the image; Peggy Phelan at the ontology of performance; Julia Kristeva at the use of oral language Shoshana Felman at the nature of speech; and Walter Benjamin used radio broadcast as a dissemination tactic. We are architectural academics and teachers who both use and analyse relationships between the visual and the verbal in our writing, practice and teaching. From ideas and discussions around the intersections between visual, spoken and written media, we propose this symposium as a generator of new questions and forms. We will examine both the format of the spoken – whether lecture, conversation or presentation – and the integration or status of the visual within it, drawing out their particularity, structure, politics and poetics. Although expressly interested in the role of drawing, we will also consider the relations of other complementary media such as photography and film. 'What is this figure of the other in me? ', Photographic Scene, Brigid McLeer 2014. Tickets are available through the ICA website. This ICA Friday Salon explores ethical questions related to working with notions of the other in art and design research and practice. It is hosted by doctoral researchers from the Royal College of Art. Drawing from themes emerging from ethics discussion groups held by RCA researchers, and also following the recent Dor Guez exhibition at the ICA, the Friday Salon will explore what is at stake in making work and research in which a notional other is implicated, whether that other is conscribed in terms of politics, geography, history, material, the institution, ecology or indeed the other of art and design research itself. By drawing on a range of theory on this subject from psychoanalysis, feminism, new materialism, postcolonial and posthuman studies, as well as the writings of philosophers such as Jane Bennett , Jean-Luc Nancy, Emmanuel Levinas, Jean-François Lyotard and Jacques Rancière, the discussion will investigate the ethical challenges facing contemporary practice when it comes to consider the other as its subject. Ethics of the Other precedes the opening of the RCA Research Biennial Why Would I Lie?, which is exploring ethics and aesthetics in contemporary art and design research and practice and runs from 18–25 April with a major conference on 18–19 April. The form of the Friday Salon will be relatively informal. It will begin with a number of short presentations by the RCA researchers and will be followed by questions from the audience. Presentations will be given by Manca Bajec, Helena Bonett, Susannah Haslam, Peter Le Couteur, Carol Mancke, Brigid McLeer, Peter Wareing and Mercedes Vincente. Dr Kristen Kreider will chair the salon. On Thursday, 19th March from 6.00pm-8.00pm at The Island Queen in London, Copy Press will be hosting an evening to celebrate the publication of Falling. The evening will entail a short reading from the book along with contributions of '60 seconds of movement, visual or verbal, in celebration of Falling' from other Copy Pressers. In collaboration with sound artist and architect Paul Bavister of Audialsense, we will be presenting 'Falling Fugue' at Plexus 17: Vibrations on 26th February at the Bartlett School of Architecture. This event is a taxonomy of a trajectory…from the surface of the moon to the skin of the earth. Tumbling through historical time and infinite space, we intersect with historical events and figures in motion. We tune in to their frequencies. As figures are falling we encounter something about philosophy, laughter, architecture and war. We are delighted that our book Falling has just been published by Copy Press, an independent publishing company based in London, dedicated to extending ideas of writing, pictures and readability. The books' editor is Yve Lomax, reader is Vit Hopley and designer is Ivor Williams. Reflecting on our recent trip to Open City in Ritoque, Chile, we have just published a series of artists pages in the latest edition of Performance Research: On Poetics & Performance (Volume 20:1). In this series of word-and-image pages, the collaborative pair Kreider + O'Leary reflect on their site visit to the Open City in Valparaiso, Chile. Situated in the sand dunes just off coast of the Pacific ocean, this radical pedagogical experiment was founded in 1971 by the Chilean architect Alberto Cruz and Argentinean poet Godofredo Iommi. Open City is as much a school as it is an urban laboratory and the embodiment of a utopian ideal. Here architecture is constructed on a foundation of poetry and shifting sand and, as students of the Open City, Kreider + O'Leary examine the place in detail. In this series of word-and-image pages they present these findings in a loose taxonomy: a configuration of words and lines; a cifra reflective of their study of site and that marks the beginning of their story of Open City. The front cover of the journal shows an image from our performance / installation at Open City, entitled Cifra. Performance Research: On Poetics & Performance 2015 (Volume 20:1): 70-76. We will be presenting a live rendition of Edge City employing spoken word and video mixing for 'Modes of Aberrant Research' at the Whitechapel Gallery, curated by Holly Pester. An evening of deviant anecdotes, radical storytelling and narrative segues through archives, collections and institutions. New work by SJ Fowler, Patrick Coyle, Holly Pester and Kreider + O’Leary. £8.50/£6.50 concession (£4.25 Whitechapel Gallery Members). On 17th January, 2014, we will present 'Ways to Cut the Earth Open', the second in a series of lectures entitled 'Print Screen: Writing and the Moving Image' run the by the Institute for Modern and Contemporary Culture at the University of Westminster. Ways to Cut the Earth Open’ is a cross-platform survey that examines a number of sites recently explored by Kreider + O’Leary in their nomadic practice. Using the sectional cut and the filmic splice as starting points they explore strands from their recent site-based works to thread together narratives of place and displacement. Predicated on an aesthetics of response while engaging with the complexity inherent in a given site, their work is both a form and act of communication: therefore, and necessarily, clouded by ambiguity. This prompts a critical investigation into the role of ambiguity for creative practices that relate to site, including writing and the moving image.